Nothing very new in this department; here are some recent books. 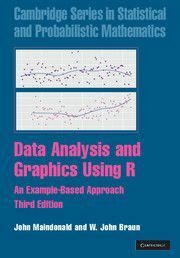 Data Analysis and Graphics Using R. An Example-Based Approach. 3rd ed. by J.H. Maindonald & W.J. Braun published by Cambridge University Press, 2010. ISBN: 9780521762939. An Introduction to the Theory of Point Processes: Volume II - Elementary Theory and Methods; Second Edition by D.J. Daley & David Vere-Jones published by Springer, November, 2007. ISBN: 978-0-387-21337-8. An Introduction to the Theory of Point Processes: Volume I - Elementary Theory and Methods; Second Edition by D.J. Daley & David Vere-Jones published by Springer, December, 2002. ISBN: 978-0-387-95541-4. Multifractals: Theory and Applications by David Harte; published by CRC press, June, 2001. ISBN 1584881542. Edited by Daryl J. Daley, Assisted by Peter J. Thomson and Yosihiko Ogata. ISBN 0 902016 07 7 (2001) xvi+296 pp.